This black and white copy of William Turner’s prisoner identification mugshot was made at the Queen Victoria Museum and Art Gallery in 1985 from Thomas Nevin’s original sepia print, and placed online at the QVMAG in the early 2000s. 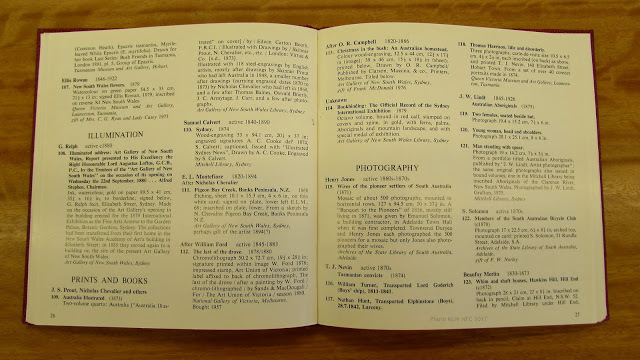 The original 1870s print of the b&w copy was exhibited at the AGNSW in 1976 (listed on page 27 in the Exhibition Catalogue). The curator chose this one (and another two photographs) possibly because the full frontal pose and the frank stare captured more of the prisoner’s “personality” than the conventional pose where the sitter’s sightlines were deflected either left or right, the pose typical of Nevin’s commercial studio practice and evident in the more than 200 (two hundred) prisoner cdvs held in the Beattie collection at the QVMAG. 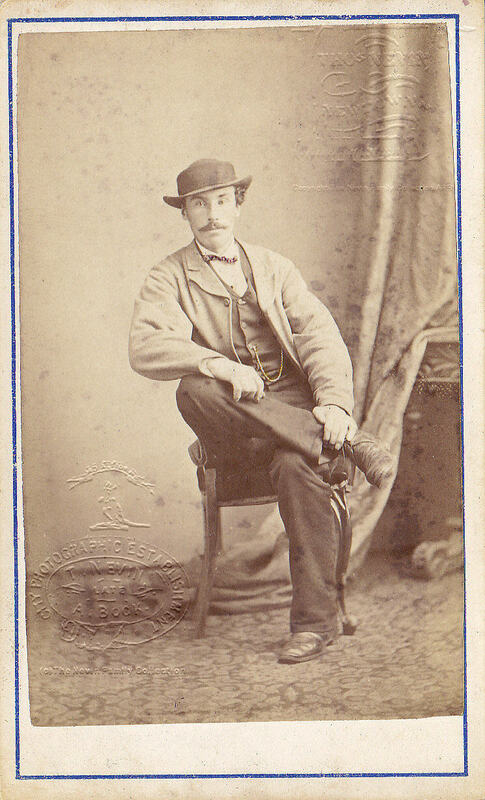 In addition, this print was possibly chosen because it had escaped the rebranding on the versos with the inscription “Taken at Port Arthur 1874” for Beattie’s tourism trade of the 1900s and for the 1938 QVMAG exhibition which commemorated his death and bequest to the people of Launceston. 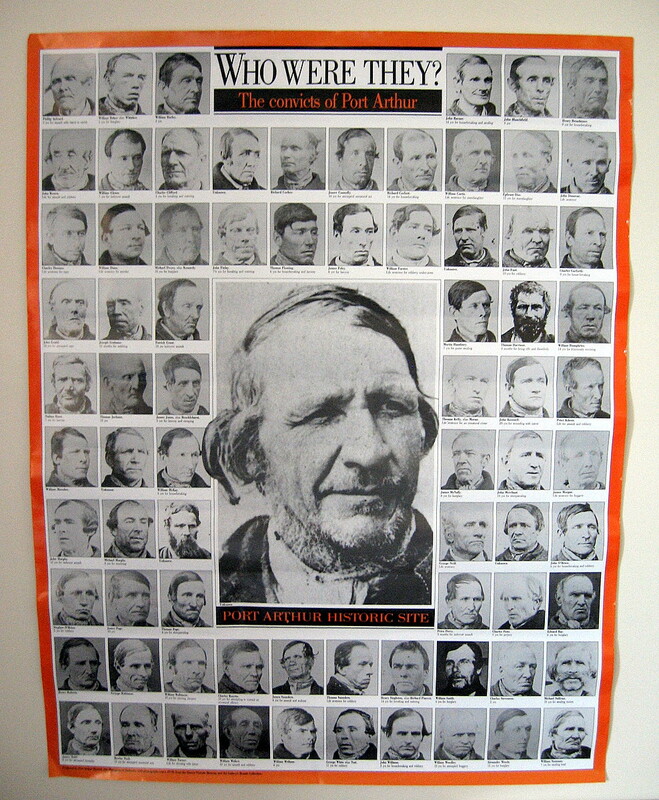 A year after the 1976 AGNSW Centenary Exhibition, in 1977, many more of these “convict portraits” by T. J. Nevin from the Beattie collection were exhibited at the QVMAG, curated by John McPhee. These records are sourced from the weekly police gazettes, Tasmania Reports of Crime Information for Police, J. Barnard, Gov’t printer. Source:The Hobart Town Daily Mercury (Tas. 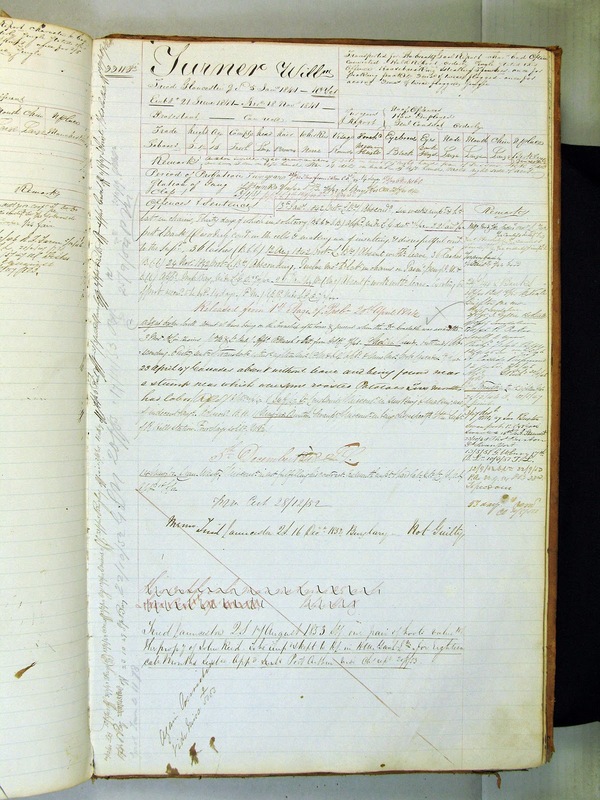 : 1858 – 1860) Thu 3 Nov 1859 Page 2 POLICE COURT. 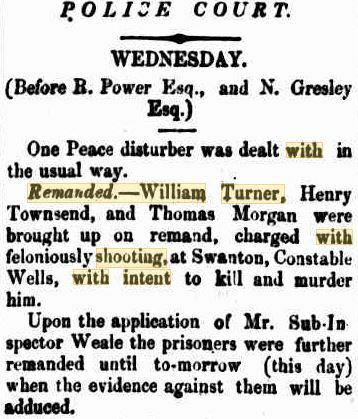 Remanded.-William Turner, Henry Townsend, and Thomas Morgan were brought up on remand, charged with feloniously shooting, at Swanton, Constable Wells, with intent to kill and murder him. Upon the application of Mr. Sub – Inspector Weale the prisoners were further remanded until to-morrow (this day) when the evidence against them will be adduced. Prisoner William Turner from Bristol. sentenced to 10 years for housebreaking and stealing was transported to VDL per the Lord Goderich, arriving on 18 November 1841 as an 18 year old. He was then sentenced at the Hobart Supreme Court on 6th December 1859 to life imprisonment for “shooting with intent etc“. 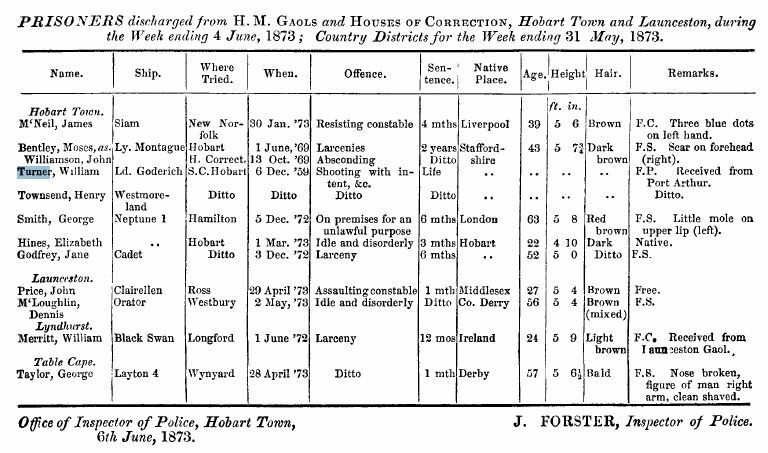 He was received at the Municipal Police Office, Town Hall from the Port Arthur prison and discharged in the week ending 4th June 1873, Free with Pardon (abbreviated as FP in the police gazette record above). William Turner may have committed further offences using aliases between his discharge in 1873 and his conviction in 1878 , as his name does not appear against any further convictions in the Tasmanian police gazettes until 1878. While working as a sawyer in the Scottsdale and Ringarooma area of northern Tasmania in 1878, Turner was convicted for the theft of a calico tent and fly from the Briseis Tin Mining Company, Cascade River. Page 152, Tasmania Reports of Crime. 20 September 1878. William Turner was suspected of theft of a calico tent and fly. 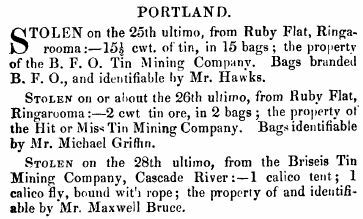 Above: Two notices published in the Tasmanian police gazettes issues of 6th and 20th September 1878 concerning thefts of four meershaum pipes and a calico tent and fly by William Turner. Source: Tasmania Reports of Crime Information for Police, Gov’t printer. 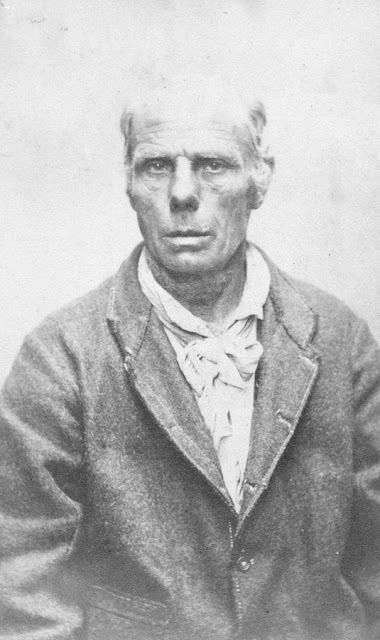 During the week of 26th October 1878, William Turner, sawyer, 57 years old, 5ft 8½ inches tall, and Free by Servitude (FS) was convicted of larceny and sentenced to 6 months. His prior conviction – a life sentence in 1859 for shooting with intent from which he was discharged free with a pardon in 1873 – was not recorded. 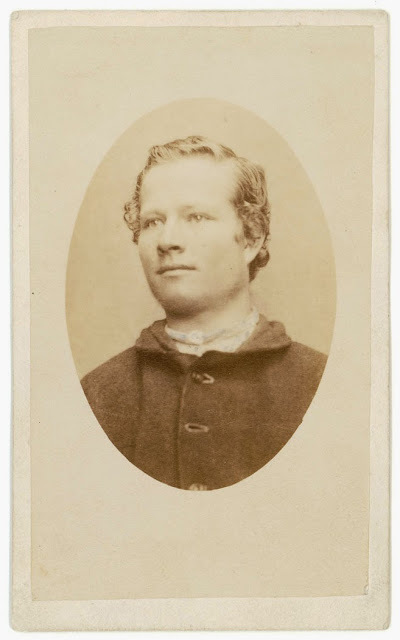 On incarceration at the Hobart Gaol in October 1878 and discharge from the Mayor’s Court at the Hobart Town Hall in March 1879, T. J. Nevin photographed William Turner in full frontal pose for police and prison records. An archivist in the early 1900s, using the police gazette record, inscribed on the verso “FS” below the prisoner’s name, William Turner, and the ship, Lord Goderich. 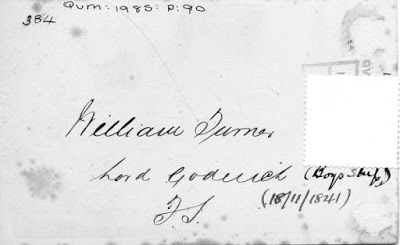 A more recent inscription in a different hand – (Boys Ship) referring to the Lord Goderich and the date of his arrival in VDL (18/11/1841) – was probably added for the 1976 Centenary Exhibition of the Art Gallery of NSW and/or the 1977 QVMAG Exhibition of more than seventy “convict portraits” – i.e. 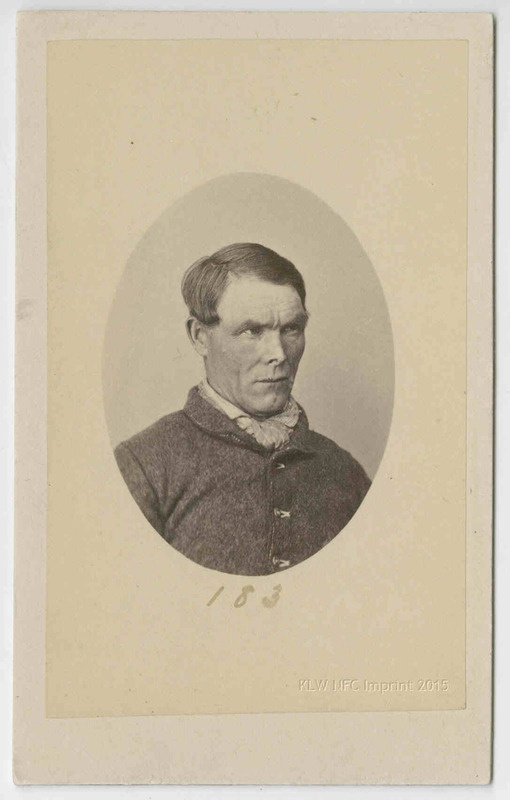 mugshots of Tasmanian prisoners taken in the 1870s by Thomas J. Nevin – curated by John McPhee. 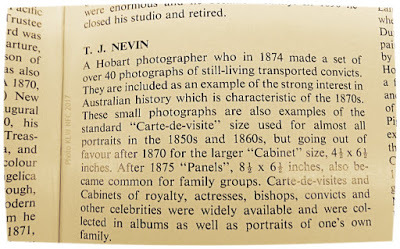 Paragraph on T. J. Nevin and his photographs of “still-living transported convicts”, p. 41 of the Exhibition Catalogue for Australian art in the 1870s : an exhibition to mark the centenary of the Art Gallery of New South Wales, Sydney by Daniel Thomas 1976. 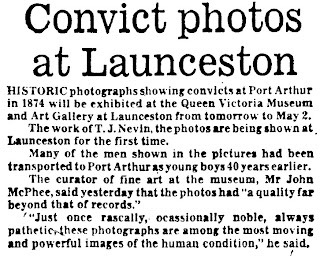 A Hobart photographer who in 1874 made a set of over 40 photographs of still-living transported convicts. 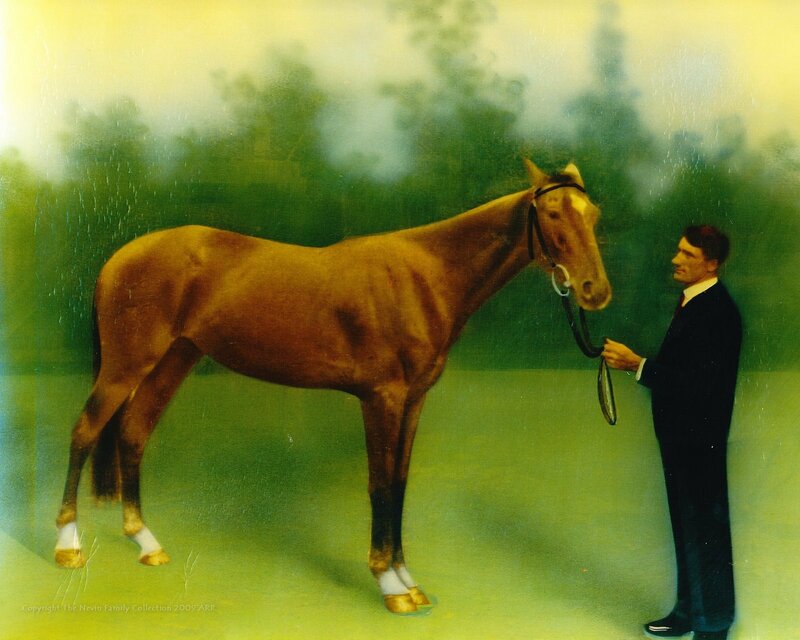 They are included as an example of the strong interest in Australian history which is characteristic of the 1870s. 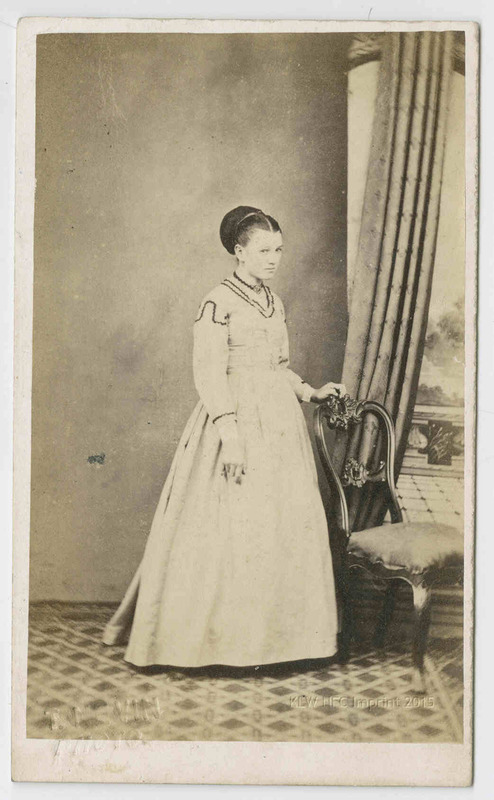 These small photographs are also examples of the standard “Carte-de-visite” size used for almost all portraits in the 185s and 1860s, but going out of favour after 1870 for the larger “Cabinet” size , 4½ x 6½ inches. After 1875 “Panels”. 8½ x 6½ inches also became common for family groups. 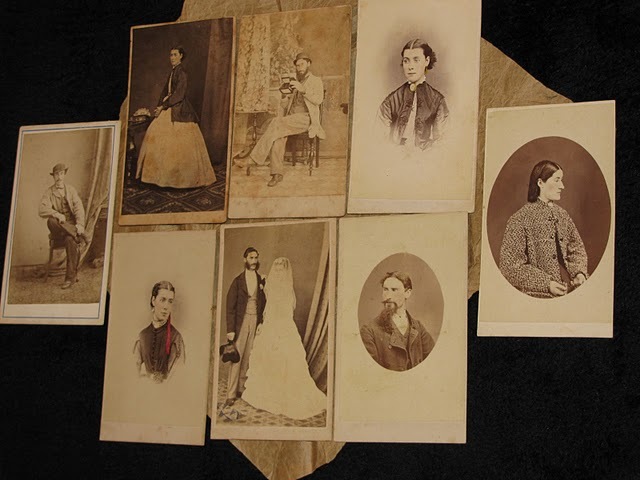 Carte-de-visite and Cabinets of royalty, actresses, bishops, convicts and other celebrities were widely available and were collected in albums as well as portraits of one’s own family. 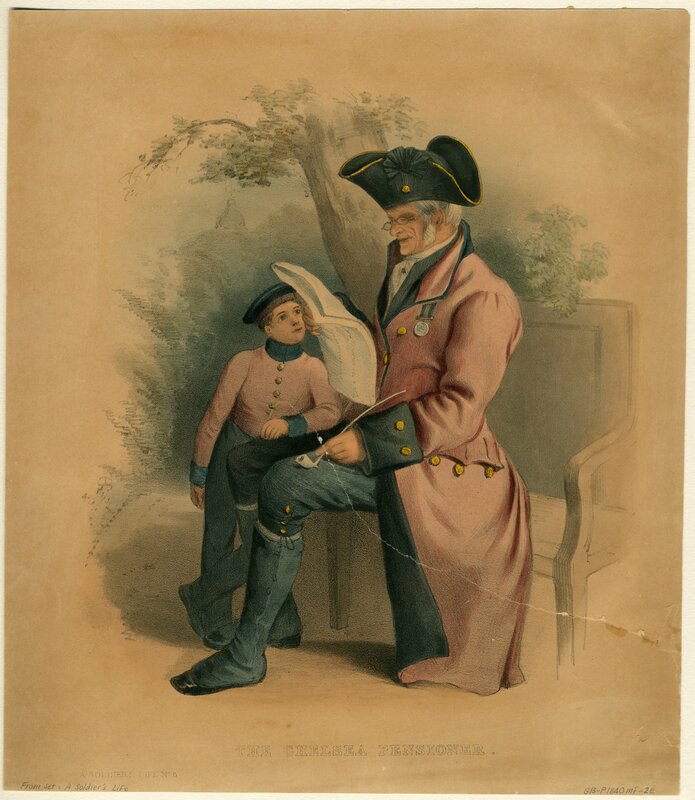 William Turner, sentenced to 10 years for housebreaking and stealing was transported to VDL per the Lord Goderich, arriving on 18 November 1841 as an 18 year old. This record gives more detail about further offences until 1853.